Saucy Mama sent me a big arrangement of their tasty sauces. I got to try the cracked pepper marinade, smoky garlic mustard, lime chipotle marinade, parmesan garlic marinade, etc. My favorite of what I have tried so far is the smoky garlic mustard! It is so delicious! I am someone who puts a ton of mustard on my sandwiches and this is great on a ham or turkey sandwich. The sauces can be purchased online for $5-8 depending on what you choose. All of theses sauces are great for marinating, grilling, baking, etc. 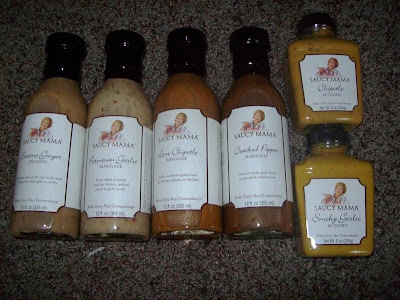 Thanks Saucy Mama for your super flavorful sauces! The Smoky Garlic is a gold medal award-winning mustard!